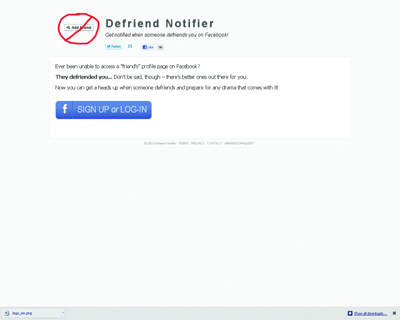 De-Friend Notifier – Get Notified When Someone De-friends You on Facebook! The application notifies users when people defriend them on Facebook. There’s really not much more to it than that. There is a void in the market for this type of notification as users have consistently requested the feature from Facebook, who have not responded. At this point in time, I have not found any competition. There was some mention of an app that was made several years ago, but I have been unable to find a working model of it.